What does this mean? How do I solve it. 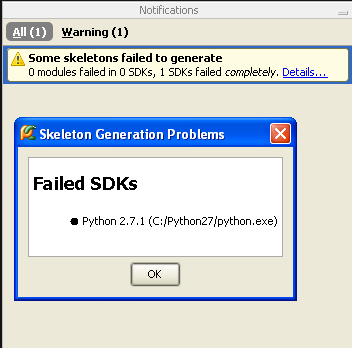 Image:pycharm skeleton generation problem.png What does this mean? How do I solve it. I've attached the log file. I forgot to mention that this also happened right after I installed 1.5.0 if that helps. the generator from the command line to check how long it takes? happened right after I installed 1.5.0 if that helps. Without it it ran for more then 2 minutes but I was unable to time it precisely. After running it the error disappears from PyCharm so I guess my problem is solved. >> happened right after I installed 1.5.0 if that helps. So I am also facing the same issue. 2016-01-25 14:09:53,920  ERROR - ns.python.sdk.PythonSdkUpdater - failed to run generator3.py for /usr/bin/python2.6: timed out. com.jetbrains.python.sdk.InvalidSdkException: failed to run generator3.py for /usr/bin/python2.6: timed out. I have tried to run the generator3.py -L at the helpers folder and it completes, but definitely much longer than 2 mins. Can we have an option somewhere such that we can set a longer timeout number?